Games that change gameplay for you based on your emotional responses and stress-level could be featured in the next generation of gaming. Imagine, for a moment, playing Left 4 Dead 2. As you shoot your way through the throngs of undead, your heart begins to beat faster, and more zombies swarm in. Your hands grow sweaty, and more deadly monsters start showing up. But when the stress almost becomes too much to bear, you find that you've killed the last zombie of the bunch. This could be the reality of the emotion-reading games of the future, catering to every person's own abilities to handle stress and fine-tuning gameplay to create the most intense but still enjoyable experiences possible. 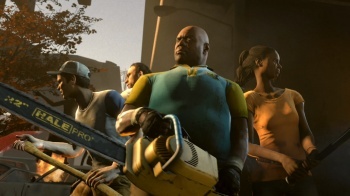 Valve is working hard towards this future, employing psychologist Mike Ambinder to aid it with its work updating Left 4 Dead 2 to compensate for the player's emotional state. The "AI Director" the game employs to command the enemies already changes the game to compensate for ability and playstyle, so L4D2 is a prime candidate for this new style of "affective gaming." "By recording the physiological responses of our play testers, we can get more precise estimations of their emotional state," said Ambinder. The testers, who claimed to very much enjoy the addition of affective gaming to the game, wore headsets equipped with small brain-wave scanners called EEG's, as well as a suite of heart-rate monitors, sweat analyzers, and devices that read how fast you breathe. Andrea Bonarini of the Polytechnic University of Milan is researching further uses of affective gaming, and has developed a car racing game with algorithms that can change the difficulty based on emotions picked up from the players by some fancy-shmancy headsets she built. While some people might want a break-neck race against brutal opponents, others might want something more akin to a nice Sunday drive, and the game gives them what they want. "The idea is to keep the user in the state they prefer," said Bonarini. So how soon before we see affective gaming make an appearance? Well, Valve's obviously committed to its project, and Bonarini is currently in talks with Ubisoft concerning her emotion-sensing headset, so it might not be too much longer. I'm not sure how I feel about that, but that's okay. Once this new tech comes out, I can just ask it how I feel.